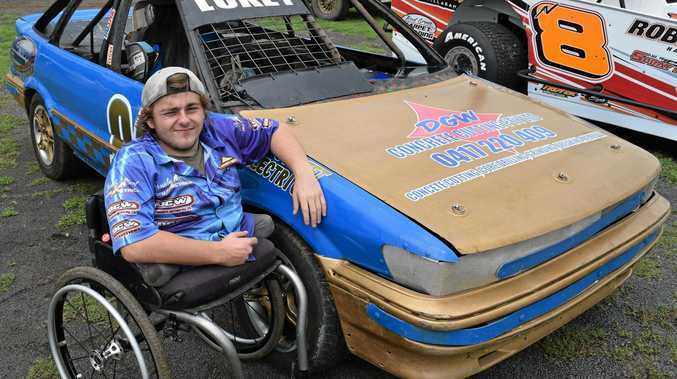 THE Lismore Speedway community has rallied around Pimlico's Luke Watt following a dramatic on-track crash that destroyed the disabled racer's car and halted his ambitious season. The Get Lukey Back On The Track page at GoFundMe, started by Parramatta City Raceway commentator Wade Aunger, has mustered $1040 of its $5000 target to rebuild #94 - Mr Watt's speedy little Toyota Corolla. The Dhu family from Casino, who raced alongside Mr Watt, is donating manpower and parts. At this rate, Mr Watt will be back on track for the National 4 Cylinder NSW Title at Cullen Bullen Raceway on January 30. "The crash happened a few weeks ago," Mr Watt explained. "We were just testing the car out before the titles. It was the first heat of the first lap, me and another car came together and my car lost it, spat me into the wall head first. It was devastating to lose the car with the titles coming up." Mr Watt, 21, was born with caudal regression syndrome, which means he is missing the lower part of his spine, resulting in his legs not forming properly. However with the use of custom hand controls, he claimed the current number three National 4 Cylinder position in NSW and won last season's Rookie of the Year. "I was leading point scores and had a podium in almost every race of the season until the crash," Mr Watt said. "But luckily, it turned out my girlfriend Bridie's mum is good friends with the commentator at Parramatta. He got on the PA while we were down there and said before the big race, 'I wanna get this guy back on the track'. "They treated me like an absolute celebrity, it was pretty cool." Mr Watt said he was overwhelmed by the support. He thanked his mum and dad, Kerrie Courtney, the Dhu family and, of course, Bridie. "She's an enormous support," he said. 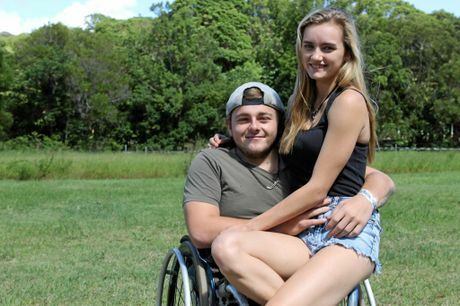 "I wasn't in a good spot when I crashed the car, but Bridie sat down and talked to me for hours, talking about what we could do."